Free online Sierpinski hexagon fractal generator. Just press a button and you'll get a Sierpinski hexaflake. There are no ads, popups or nonsense, just an awesome hexaflake generator. Press a button – get a hexagon. Created by mathematicians for mathematicians. Regular hexaflake Draw a Sierpinski hexagon with an empty center. Semi-filled hexaflake Create a fractal with an extra hexagon in the center. Fully-filled hexaflake Draw a fractal, completely filling it with hexagons. Line color Hexagon contour color. Internal color Hexagon fill color. Line Width Hexagon contour thickness. Padding Extra padding around hexagons. Direction Choose the initial movement direction of the pen. Sierpinski hexagon generator tool What is a sierpinski hexagon generator? This tool draws Sierpinski hexagons. 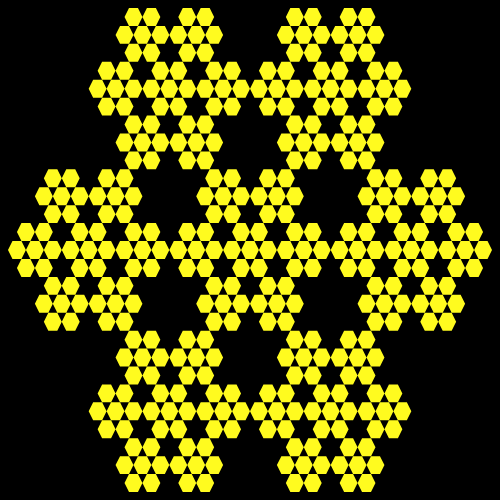 The Sierpinski hexagon, also known as a Sierpinski hexflake or a 6gon is constructed as follows. First, we take an equilateral six-sided polygon. Then, in each corner we inscribe a new equilateral hexagon but now each side is one third of the original hexagon. We then delete the previous hexagon and recursively repeat this process. With each recursive iteration we draw hexagons of smaller size and because they are always located in the corners of the previous hexagon, we retain the shape and size of the initial starting figure. 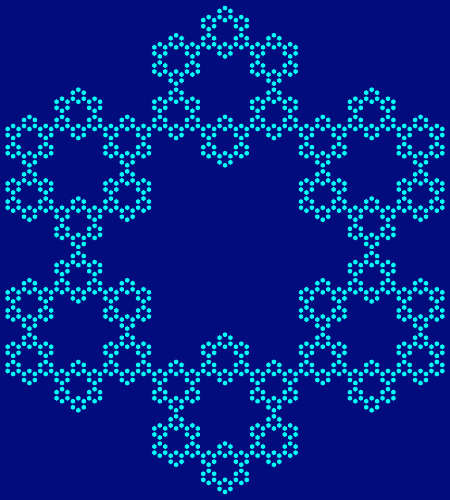 This process constructs regular hexaflakes but there are two more types of this fractal. Another way to draw the hexaflake is to do exactly the same as just described but place another hexagon of the same size in the center of original hexagon. You can try this if you select the semi-filled hexaflake option. The last type all the centers of new hexagons are filled with more hexagons. You can try this if yous elect fully-filled hexaflake option. Other options that you can change is depth of recursion, width and height of the fractal, padding around it, background, fill and border color, border width, and initial movement of drawing pen (change orientation of the fractal). Mathabulous! This example generates a fifth order Sierpinsky hexflake on a 450 by 500 pixels rectangle canvas. It also changes the drawing direction to up so the hexagon is rotated by 30 degrees. We also select the type of this hexflake to be regular, which means centers of the shape are left empty in all iterations. Additionally we set padding to 5 pixels and contour line's thickness to 1 pixel. This example draws three iterations of a Sierpinski hexagon but with an additional hexagon in the center. What you get is seven hexagons. This is accomplished by setting the semi-filled hexaflake option. In this example we choose the fully-filled hexagon option. What this does is it fills all the hexagons with another extra hexagon and you get hexagons in hexagons. This example sets curve contour thickness to zero and as a result only two colors are used – yellow for hexagons and black for the background.